(1) If X is true, then Y is true. (3) Therefore, Y is true. (1) If the Bible is the Word of God and teaches that Jesus was raised from the dead, then Jesus was raised from the dead. (2) The Bible is the Word of God and teaches that Jesus was raised from the dead. (3) Therefore, Jesus was raised from the dead. Of course, we do not always arrange our arguments in such a formal way, but it can be helpful. Also notice that just because we have stated a belief in a tidy way does not mean we have really proven anything. We still need evidence to show that each statement in the proof is true. What kind of evidence is required to prove a claim? Some people believe that we must rely totally on empirical evidence (i.e., the five senses). However, many of our most settled beliefs are not founded upon the five senses. For example, I have never seen my own mind, but I have good reason to believe that my mind exists. I have never seen London, England, but I certainly believe that London exists. It is not always necessary for beliefs to be verified through the five senses. Our reliance on non-empirical evidence in no way weakens our belief in God or in Christianity. In fact, there is a sense in which theism and Christianity are both supported by precisely the same kind of evidence that is required in a contemporary courtroom. To support theism, we have the evidence of a world that could exist only if there is a Creator (Romans 1:20). To support Christianity, we have the eyewitness testimony of the most reliable witnesses (1 John 1:1-3). God has never expected people to believe in Him or His revelation without offering sufficient reasons to satisfy our rational natures (see Isaiah 1:18; Hebrews 1:1-2; Acts 2:16-51; 1 Thessalonians 5:21; Titus 1:9; 1 John 4:1). Apologetics is simply an attempt to use our God-given rationality in concert with the evidence made available to us. I was once at an event to speak on apologetics when a gentleman (call him Bob) told me that I was presenting apologetics wrongly because I was presenting nonbelievers with evidence to convince them of the truth. Bob explained that what these sinners needed was not evidence or argumentation, but a change of heart. Bob was saying that because nonbelievers have a moral roadblock or an inclination that keeps them from believing, it does no good to appeal to them with rational argumentation. Why do folks like Bob dismiss the importance of evidence? One reason is this: Presuppositionalists think that nonbelievers know the truth deep down, but “suppress” it because they do not “see fit to acknowledge God” (Romans 1:18, 28 esv). In other words, the nonbeliever’s problem is strictly moral, not intellectual. Only after he repents will he be able to acknowledge the truth of what he already knows (cf. Frame, “The Unbeliever’s Knowledge”). Similarly, Romans 1:28 is not specific about why people “did not see fit to acknowledge God.” Perhaps they misunderstood the evidence; perhaps they had some inclination against God. The fact is that the human intellect and the human will both contribute to human action and belief. People may deal wrongly with the evidence, but they still need the evidence. Some saw Christ’s miracles and disbelieved. They failed to draw the right conclusions from the signs, yet they still needed the signs (John 3:2). Others saw the same miracles and believed (20:30-31). So I admitted to Bob that nonbelievers need to repent. Then I asked Bob whether the following scenario is possible: A person wants to believe in God but does not feel justified in believing in God because of all the evil in the world. Bob agreed that such was possible. I then asked Bob if a rational argument (such as Thomas B. Warren presents in Have Atheists Proved There Is No God?) might ever be necessary for someone to come to belief. Bob tacitly admitted that evidence can be important in convicting the nonbeliever. Finally, consider this: Someone like Bob, who has rejected the use of rationality to test his own beliefs, is faced with a serious philosophical problem. If he does not disprove every possible belief system other than the one presented in the Bible, then he can never be sure he has the correct belief system, for the one belief system he has failed to falsify just might turn out to be the right one! Or the one system he has presupposed to be true just might turn out to be another false system. He can know his system of belief is correct only after examining the evidence that supports the truth. You do not have to be a presuppositionalist in order to presuppose some things. In fact, all rational people must presuppose the basic rules of reasoning (e.g., a proposition cannot be both true and false at the same time and in the same sense). It is impossible to offer reasons for such principles, so they must be presupposed. 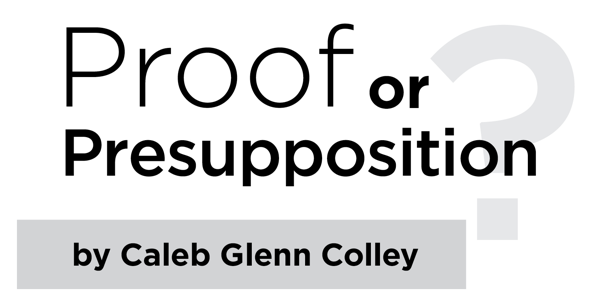 Caleb Glenn Colley is a doctoral candidate in the philosophy department at the University of South Carolina. He can be reached at calebcolley@gmail.com. Bahnsen, Greg. “Presuppositional Reasoning With False Faiths.” Answers in Genesis. <http://www.answersingenesis.org/articles/2009/04/08/presuppositional-reasoning-false-faiths (2009)>. Frame, John M. “God’s Revelation Our Presupposition.” Audio Lecture. Reformed Theological Seminary. <https://itunes.apple.com/us/course/gods-revelation-our-presupposition/id537705979? i=117079046&mt=2 (2012)>. —. “The Unbeliever’s Knowledge of God.” Audio Lecture. Reformed Theological Seminary. <https://itunes.apple.com/us/course/unbelievers-knowledge-god/id537705979? i=117079043&mt=2 (2012)>. Warren, Thomas B. Have Atheists Proved There Is No God? Ramer: National Christian Press, 1972.